Footage of “A Dog’s Purpose” Movie Shows Animal Abuse-Disputed! - Truth or Fiction? Footage of “A Dog’s Purpose” Movie Shows Dog Forced into Water-Disputed! 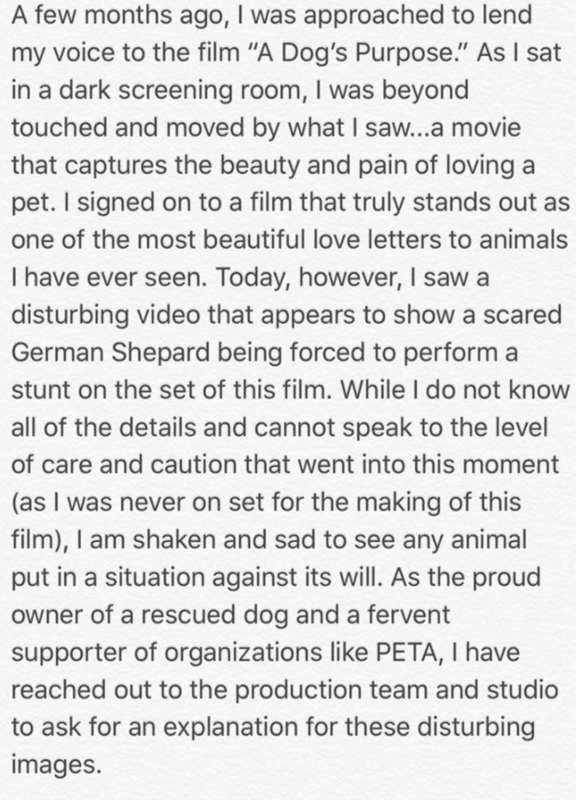 Smartphone video taken during the making of “A Dog’s Purpose” in 2015 shows a German Shepherd being forced into rushing water, leading to claims of animal abuse. Amateur video of a terrified German Shepherd being forced into rushing water during the making of “A Dog’s Purpose” was obtained and published by TMZ — but the film’s producers dispute claims that animals were mistreated during the making of the film. Grainy smartphone video of the “A Dog’s Purpose” shoot shows a scared German Sheppard (later identified has “Hercules”) being forced into a pool of rushing water against its will. Hercules desperately claws at the edge of the pool being thrown into the water by a handler. Then, the video ends with a cut to a clip of a dog, appearing again to be Hercules, sinking just before it ends. The video instantly went viral. Some argued that the video was clearly animal abuse and called for a boycott of “A Dog’s Purpose” in response. Others claimed that the video was shot and edited by a PETA operative to present the movie in a bad light. Still others claimed that TMZ had received the clip in 2015 and held onto it until just before the release of “A Dog’s Purpose” without showing any concern for the dogs in the film in the meantime. Starring Britt Robertson, Dennis Quaid and Josh Gad, “A Dog’s Purpose” is a movie about a dog that “looks to discover his purpose in life over the course of several lifetimes and owners.” It was set for release on January 27th. According to the producers and studio, several days of rehearsal took place to ensure the dog was comfortable while performing the water scenes. The statement confirmed the dog was at one point hesitant to perform the water stunt, but it insisted filming did not continue. A letter from actor Josh Gad. In the end, we’re calling this one “disputed” because the smartphone footage of a terrified German Shepherd being forced into a pool of water during the filming of “A Dog’s Purpose” is real, but the film’s producers insist that Hercules was not harmed and no animal abuse occurred in the making of the film. Protest Donald Trump's Inauguration By the Changing Channel-Mostly Fiction! President Obama Placed Life-Sized Bronze Statue of Himself in White House-Fiction!